Grimsvötn is heading for an eruption. There can be no doubt about that. Of course, it is always heading for an eruption. This volcano has ADHD. For Grimsvötn, more than a decade of brooding is unusual: normally it just throws it out. A misplaced snow flake can set it off. And it produces not only volcanic ejecta. In hindsight, it was unwise to grow a glacier on such a hot head. The ice melts and collects in a subglacial lake. Once enough water has collected, it lifts the constraining glacier and escapes. The jökulhaup that follows heads straight for the south coast, carrying big blocks of ice with it. The volume of water Grimsvötn generates exceeds the volume of its volcanic ejecta. This is the ultimate mountain of ice and fire, with a temper to match. Grimnsvötn is heading for an eruption: no doubt about it. But science wants to know more. It wants to understand how the mountain works and why (and when) it erupts. That means making a model, and to validate a model requires making a prediction. If the prediction come true, the model is deemed to work – for now. If it fails, science goes back to the drawing board. And it is essential that the prediction is about the future. Predicting the past does not count: that is inside knowledge which already went into making the model and so can’t be used to validate it. Grimsvötn will erupt. A year ago, Carl and I had a challenge, to predict when the next eruption would be. I used math and came up with January 2020 to June 2022. Carl used magic sorry insider knowledge insight and knowledge and came up with December 2018 to December 2019. So far, nothing has happened, so we were both right. But when the activity increased during the past month, we decided to revisit our predictions. After all, a prediction is only a validation if you check whether it worked! We are not politicians: we cannot quietly ‘forget’ what we said last year. Science is brutally honest, and a wrong prediction is not a failure but an opportunity. It improves the models. Carl wrote his update last week and failed to change his prediction. It remains December 2018 to December 2019. So what about my prediction? Is it time to throw in the towel? The closer to the eruption, the better the forecast is likely to be. I had a bit more time than Carl so decided to wait, and see whether Grimsvötn would do anything that helped my models. If that gave me an advantage over Carl, who am I to complain? Against magic knowledge, I need all the help I can get! And indeed, things did happen. Volcanoes are like metal fatigue. A minute crack forms, and over time it grows into a full scale failure. The final failure is certain. The speed at which the cracks grow it accelerates as the crack grows: it is self-reinforcing. But the ‘when’ of fatigue failure is not predictable because it depends on the chance stress events which first cause or enlarge the cracks. So it is with volcanoes. The crack can suddenly and unexpectedly grow. A year ago, Carl wrote: In fact, there could at any time come a rogue earthquake swarm, or a single M4 earthquake, that punches the value [of cumulative stress] fast into the eruptive ranges. It is though not as likely judging from previous behaviour of Grimsvötn. But this week, Grimsvötn did do just that. A single quake pushed up the plots to the danger area. But before going into how this affects the predictions, first a bit of background. There is a lot of background. Grimsvötn is Iceland’s most active volcano. It is also the best hidden one. Hiding an active volcano is not easy: an extended icecap helps, but eruptions leave signs even if the area is inaccessible. The fires above the glacier were a dead give-away that there was a volcano somewhere amidst the ice. The frequent jokölhaups were another. And ‘frequent’ is the word. For the past 800 years, Grimsvötn has erupted on average every decade. Before that, it is was even more frequent. Most eruptions are small, around 0.1 km3, such as the 2004 eruption. But when the occasion is right, it can also go bigger, as it did in 2011 when it had its biggest burp for 140 years. And 2011 was by no means the worst it can do. The so-called Saksunarvatn ash is a 10,000 year old layer of tephra found across the Faroe islands, northern Europe and Greenland. The composition of the ash shows that it came from the Grimsvötn magma reservoir. In the Faroe islands, the ash is in places a staggering 45 centimeter deep. In addition to this large explosion, there are several smaller tephra layers close to the thick ash, showing that several smaller eruptions occured within about 500 years of the main event. Grimsvötn really threw a tantrum! The total tephra volume of the Saksunarvatn ash may be over 30 km3 although the precise value is very poorly known – so much ended up in the ocean. In comparison, even 2011 was just a hick-up. Grimsvötn also mixes up eruption styles. Most often it does explosions from the summit or along small fissures near the summit, but on occasion it also feeds effusive eruptions from a much more extended rift system, 90 kilometers in length. Mount Laki formed from Grimsvötn magma. And in 1783, the rift again gave way and the largest Icelandic eruption since Eldgja devastated the country. It is called Laki, although Laki mountain itself did not take part. After the Laki eruption, the listed population of Iceland had decreased by 25%. This volcano packs a punch. In spite of its hidden nature, the Icelandic people were well aware of this invisible volcano. The ice-covered lake of the Grimsvötn caldera was known very early on. It may have been more accessible in the past, before the major glacier growth of the little ice age overran the local farms. So it was clear that Grimsvötn was known and had been visited. The Atlas Danicus (1684) contains an account of a volcanic eruption in Grímsvötn and Grímsfjall in the so-called Gríms Vatna Jökull glacier. Maps which for the first time showed the caldera at the right location appeared in 1730. But as the glaciers advanced, the stories became less clear, and began to sound almost mythical: ‘Men have seen 15 separate fires burning on the surface of the lake; what the cause of this can be, people find hard to say, except perhaps that it is caused by an overabundance of sulphur deep in the Earth, for whenever folk ride by these glaciers there is the most powerful odour of sulphur there could ever be’. [the jökulhaup] occurred at the same time as an eruption in Skeiðarárjökull (?) [nearer Þórðarhyrna] which often happens, to a greater or lesser extent, when there is an outburst in Skeiðará river. Flames arose north and west of the so-called Grænafjall mountain, which lies to the north of Eystrafjall, on Thursday 28 May, upon which the floodwaters increased as the glacier melted, searching for channels with such power that they burst open the front of the outlet glacier and surged forwards with blocks of ice that, according to the post bearer, were 60 feet high, and over a wide area there were others on top of them another 25– 35 feet thick. [..] The most terrifying jökulhlaup was on Thursday and Friday night, when the eruption had begun and was at its peak. Water spurted up in high columns through cracks opening up in the glacier and all the ground and houses in Skaftafell and Svínafell in Öræfi shook so much in an earthquake that windows were broken in Skaftafell, and thuds and bangs were heard as far east as Hornafjörður, for there was a westerly wind. The evening and night sky were lit up by the volcanic flames that stretched high into the sky and from its smoke came flashes of lightning that brightened the land and rivers all the way out to Álftaver, and this was later than ten o’clock at night. A cloud of smoke lay over the Öræfi district, concealing the mountain tops above Sandfell and Hof in black billowing waves with flashes of fire and lightning streaking from them above the farmsteads. Even the earth itself shook when the glacier was cracking open and the explosions louder than the firing of any canon. All of this combined was so terrifying that the folk of Sandfell (Pastor Ólafur himself had recently just left to the west with two children) fled eastwards to Fagurhólsmýri. Fortunately, there was no consequent ash fall, and the cloud and eruption were much milder the next day, indeed the jökulhlaup itself was beginning to abate. In 1919, two Swedish students, Hakon Wadell and Erik Ygberg, set out to explore the possible causes of the jökulhlaups that frequently emerged from beneath Skeiðarárjökull, unaware that they were retracing the past. They found the glacier very difficult to traverse: they had four horses pulling the sledge, but this was hard going because of a 10-cm thick cover of tephra, which had come from the large eruption of Katla. Suddenly, the front horse stopped, refusing to budge or go any further forward no matter how hard the students beat it. A slight break in the fog appeared, and they found they were standing on the edge of a precipitous cliff. The horse had sensed the up-draught at Grímsfjall! ‘When we came to the head of the horse, there appeared below us a crater comparable to the side of hell in size, though even that would have been expanding in these recent and most difficult times.’ The crater welcomed them with ‘… the rumbling of ice rocks that continually crashed from the cliff walls, hundreds of metres high, down into the crater’s basin where they melted in warm, emerald green water.’ Typical students, they toasted their discovery with cognac and christened the caldera Svíagígur (‘Swedish crater’), a name that did not catch on. They continued to cross Vatnajökull but had to abandon their horses due to the conditions. The went back afterwards and two of the horses were recovered; the other two and a dog are presumed to have died. The atrocious conditions of the ice and the weather left their mark: Ygberg never fully recovered his health after this trip. And they failed to convince the world that there really was a major volcano hidden in the icecap, something they both reportedly felt bitter about in later life. Who believes students? Grimsvötn erupted again in 1934, and this time people were able to travel to the caldera during the the eruption. It left no doubt that this was the origin. The travel was as difficult as it had been in 1919: the thick layer of ash made sledging and skiing impossible so the explorers had to walk for 20 kilometers towards the eruption plume. There may have been some health and safety violations: ‘Clumps of slag, pieces of lava and chunks of the crater bed lay in heaps and mounds, in some places as if raked together like haystacks, and the nearer we reached the edge of the crater, the more grandiose everything became.’ And more dangerous: they reported that plumes of steam, yellow, green and steel-coloured, billowed up through a gaping wound in the ice sheet while black pillars of smoke were flung into the air from the pillar lava. Clouds of steaming sulphur seared their lungs as cinders rained down onto the glacier and hissing and sucking sounds were heard all around them as well as a loud rumbling from the deep. Their observations confirmed that the two Swedish students, 15 years earlier, indeed had discovered Iceland’s most active volcano. The icecap that covers Grimsvötn is Europe’s largest glacier (by volume; by area it is the second largest). Snow and ice have a way of smoothing over the cracks and calderas. This glacier indeed covers a multitude of sins. 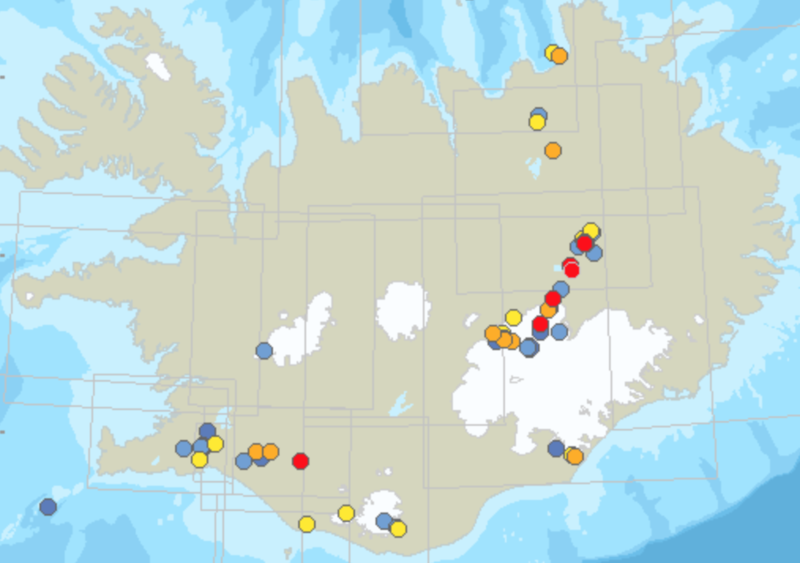 Remove the glacier and no fewer than five volcanic centres appear: Öræfajökull, Bárðarbunga, Kverkfjöll, Grímsvötn, and Hamarinn. They sit on a 700-meter tall massif, bisected by a deep valley. The valley runs runs south-southwest to north-northeast, parallel to the main spreading axis. The main volcanic activity is in the ridge west of this valley, where Grimsvötn has pride of place. The glacier around Grimsvötn contains a detailed record of previous eruptions, in the form of layers of ash. This has been used to derive the eruption history. Between the years 1200 and 1800, there are 66 separate ash layers, each from a local eruption within the icecap. Five of these layers indicate that two different volcanoes were erupting in the same year, so the total number of eruptions in these 600 years was 71. Eruptions on the fissures outside the glacier will not be included. Adding the 15 more recent eruptions bring us to 86 eruptions between 1200 and 2000. Two thirds of the ash layers come from Grimsvötn: it erupts more than twice as often as Bardarbunga. In fact, Grimsvötn is responsible for over a third of all eruptions in Iceland. Not bad for a volcano only officially discovered in 1919! Going back in time, the frequency of the ash layers further increases. The peak activity was between 1000 and 2000 years ago. This was a time when the glaciers were less extended, and perhaps this made eruptions easier. Recent eruption were in 1903, 1922, 1934, 1954, 1938, 1983, 1996, 1998, 2004, 2011. In spite of the high frequency, there were no eruptions in Vatnajökull between 1938 and 1983, 45 years of quiescence. It now seems unbelievable. But this is part of a pattern. The ash layers show that times of frequent eruptions were interspersed with times of less frequent ones: these two phases alternate every 50-80 years. Around 1950 was the depth of a period of infrequent activity. Large eruptions, such as the 2011 one and 1873, seem to occur about every 140 year, i.e. once in a combined high/low frequency period. Eruption volumes are not well known because so much is intercepted by the ice, but are in the range 0.01 to >0.5 km3. The 1996 Gjalp eruption produced 0.45 km3. Over the past 1000 years, Grimsvötn has produced an estimated 15km3 of lava and14km3 of tephra, or 21km3 DRE in total (remembering that tephra is three times less voluminous as DRE). Of course, the lava output is almost entirely due to Laki! The minerals that are found in the ashes trace the conditions under which the magma crystallized. Certain minerals form at certain pressures and temperatures. The ones found in the ashes formed at a depth of 15-17 km, and that is where the main Grimsvötn magma chamber appears to be. The crystals in the Laki eruption formed at the same depth and a temperature as those found from the 1823 Grimsvötn eruption, further strengthening the hypothesis that Laki lava came from Grimsvötn (other evidence is the lava composition and the fact that Grimsvötn itself erupted at the same time as Laki). The summit eruptions themselves come from much shallower magma, fed from the deeper magma storage. The most recent eruptions have minerals from a wider range of temperatures and pressures, more so than during the 19th century. The model for this is a series of dikes and sills, of different depths, fed from the 15-km reservoir, where the efficiency with which magma moves from the deeper reservoir to the sills has been decreasing with time. The 15-km deep reservoir is likely fed from a neutral buoyancy layer at the mantle-crust boundary, 30 km deep. Holuhraun had a more primitive magma, but with similar crystallization depth as Grimsvötn. The eastern volcanic region may well have a series of such magma reservoirs at 15+-5 km deep, which stores magma for a shorter time for Bardarbunga, and longer for Grimsvötn. Laki was fed from such a reservoir, either directly or indirectly, where the data shows that the same reservoir also feeds Grimsvötn. A deep connection between Bardarbunga and Grimsvötn seems possible. A paper in the last year pointed out that in the year before Holuhraun, Grimsvötn stopped inflating. It implied that magma was being diverted. The amount of magma involved was rather small (0.015 km3), but it indicated a connection. Either magma was transferred from Grimsvötn to Bardarbunga, or there was a pressure imbalance in a deep common reservoir (30 kilometer deep). The latter seems more likely. As Grimsvötn 2011 showed some evidence for a magma recharge of the deep reservoir, it is possible that the same recharge also was the ultimate cause of the Holuhraun eruption. The minerals found in the ash indicate the temperature at which crystalization occurred, i.e. the main storage chamber. This shows an interesting effect: the Grimsvötn magma system appears to be slowly cooling. The temperature of the Laki magma (1783) was 1140 C. The composition of the Saksunarvatn ash indicates the same temperature. But eruptions in 1823 and 1873 indicate magma temperatures of 1130 C, and the 2004 and 2011 eruptions gave 1110 C. A paper by Hadadi et al. (2017) find a cooling rate of around 0.1C per year over the past 200 years. The 2011 eruption was the first to show evidence for FeTi particles, a lower temperature mineral: previously the magma had been too hot for this mineral to form. So how does an eruption proceed? A description of events leading up to the 2004 eruption by the IMO gives an idea what we might expect. Earthquake activity began to increase in the middle of 2003. Tremor was first seen at Grimsfjall in August 2004, each burst lasting 30 minutes. In October, the earthquakes increased in strength from mostly M1 toM2. The IMO report notes that in October 2004, the GPS station at Skrokkalda (SKRO) started rising, by 40 mm in three weeks, and moved west. This was seen as evidence for strong inflation. But in hindsight (a popular alternative to insight), it is not so clear. SKRO is 56 km from the eruption site, and the the magma reservoir supply would have had to be enormous to give such an effect. Inflation is commonly seen around the glacier in late autumn, due to the increasing weight of the snow. Looking at the SKRO signals now, its motion was probably nothing to do with Grimsvötn. On 30 October 2004,a jökulhaup occurred. This is in itself not unusual. The autumn snows can trigger them. For instance, the jökulhaup in 2010 occurred on almost the same date, 31 October. But it is quite possible that the increasing heat accelerated the snow and ice melt, filling the lake. However, the ice above the lake floats, and therefore melting it does not change the pressure on the surrounding ice. For that to happen, either ice from the surrounding glacier needs to flow down and fill the basin (a slow process which happens after every eruption), or ice and snow further away need to melt and flow towards the caldera lake. This requires activity on the short fissures around Grimsvötn, and in fact several times a jökulhaup came after an eruption north of Grimsvötn, causing melt water to flow into the caldera. This happened in 1861, 1867, 1892 and 1938. A summit eruption should not trigger a jökulhaup because it melts already floating ice. However, it is possible that a jökulhaup can trigger a summit eruption. It quickly removes a lot of weight from the caldera, and the lower pressure can initiate an eruption. Two days after the jökulhaup, on November 2, the mountain erupted and Grimsvötn had again made its existence known to the world. Now let’s get back to the topic of this post. Can we make a prediction as to when the next eruption is likely to happen? How well did it follow the predictions from a year ago? Earthquake activity has significantly increased since last year. Tremor has not yet been seen: even Friday’s (23 November) M3.2 event (unusually strong for the caldera) was purely tectonic in nature. That would suggest that we are at least a month away from the next eruption, if it follows the 2004 path, and it could still be years. Here, tc is the time when things actually break, measured in days since the previous eruption. A larger tc means a slower build-up to the eruption. The factor k is a scaling constant, and M is the total cumulative moment, as plotted daily by IMO. The equation is normally used for number of events rather than moment (strength), and this version basically assumes that all individual events (earthquakes) are of similar size. That makes it rather difficult to deal with much a single much stronger earthquake, such as the recent M3.2. Should it count as a single quake, should it count for its strength, or should it be deleted from the data? Now I quote myself from last year: The plot shows the results obtained with this equation. Green is for data leading up to the 2004 eruption, blue the 2011 eruption, and red for the current cycle. The data has been read off from the IMO plots and there may be some inaccuracies. I first fitted the equation to the data leading up to the 2004 eruption. The curve fits the data well if I take the numbers tc=2200 days and k=1.2. When I fit the data leading up to the 2011 eruption in the same way, it yields tc=2550 days, and the same value for k. Interesting, the curve suggests that the 2011 eruption happened slightly ahead of schedule, by some 100 days. The Grimsvotn eruptions. Plotted is the cumulative seismic moment (total energy released by earthquakes) since the previous eruption. Click on image for more detail. We can also now fit the current cycle in the same way. There are two problems with this: the cycle isn’t far enough yet to give a unique solution, and the fit is quite dependent on the single earthquake around day 1850. Regarding the first problem, the range of dates for which the fit is made to work is quite small. That makes is susceptible to noise, random fluctuations in the earthquakes. I went for a fit which works best towards the later dates, where the random noise becomes (hopefully) less important. For the second problem, I have plotted the cycle both with this jump, and without it (the lower red line at the end). Using the same value of k as found in the previous two cycles, that gives me two possible values for tc (noting that both are still quite uncertain! ), tc=3200 days including the jump, and tc=4000 days excluding it. Say 8.5 to 11 years since the previous eruption. But be aware that the current cycle is still in an early phase and the fit could easily change – it is not yet well determined. Looking back at what I wrote a year ago, I missed one aspect. Perhaps the 2011 eruption being ahead of schedule was because of the jökulhaup? Was the 2011 eruption triggered rather than purely spontaneous? But let’s get back to the current events. How does it look like now? Over the past year, initially the progression was slow. There was continuing earthquake activity, but it was not particularly strong and the total cumulative moment rose slower than predicted. But over the past few weeks, the mountain has kicked into action. Friday’s M3 quake has brought to total seismic moment to within a factor of two or eruption values. On the left is the ‘fast’ fit. The fit is not great with the data continuously falling below the projections since the time the fit was made. The burst of quakes of last week has brought the curves closer, but it is not a convincing fit. On the right is the ‘slow’ fit. Here the fit is better, with the two curves staying closer together. The M3 earthquake has brought the data from below to above the curve, but it remains not far off. It is interesting that in both cases, the data stays well below the model until mid 2014, after which it sharply increases. This change coincides with the onset of the Bardarbunga eruption. This was interpreted above as a possible diversion of magma. The plots here show that Grimsvötn recovered once Bardarbunga erupted. This shows that the issue was pressure, not magma transfer. As magma rose into Bardarbunga, it sucked magma in from a wider area and reduced the pressure underneath Grimsvötn. Magma does not flow from one reservoir to the next: the communication is through a deeper region. So far, no reason to change the predictions of an eruption around 2021. But the fits are not great. Can we do better? There are two things we can change. First, during 2018, the activity at Grimsvötn was very low. In a way, this looks similar to the pre-Bardarbunga episode. Is it possible that Grimsvötn was affected by the magma rising into Öræfajökull? If I discard this phase, and just fit the recovery last week, it gives me the left plot below. Now the eruption is predicted for early 2021. The second try is by assuming that the 2011 eruption removed so much stress that the onset of the build-up to the next eruption did not start immediately. Picture the Grimsvötn magma chamber as being surrounded by en elastic band (a bit like stretchable trousers). The build-up to the next eruption begins when the elastic band begins to expand. After the eruption, the band was larger than the remaining chamber, and so there was no stretch – compare your loose-fitting trousers after a crash diet. After some time, enough weight magma has been added that the band begins to stretch. This is the moment that the clock begins to count. This situation with a no-stretch-phase is depicted in the plot on the right. I get a decent fit with an 800-day delay. The fit is not bad, and based on appearance (‘goodness of fit’) it seems better than the others. 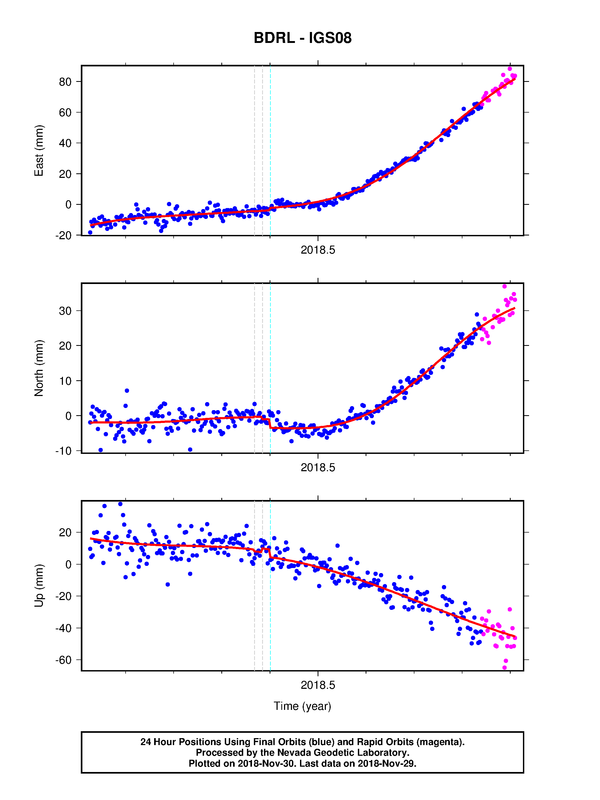 It has much less of a dip prior to the Bardarbunga eruption. However, the 2018 quiet months are still notably discrepant. In this fit, the eruption is predicted for mid-2020. So there are still a range of possibilities. The next few months will tell us what will happen. All the models here predict that the flurry of earthquakes of last week won’t continue at that rate. There will be a decline again in activity, although perhaps not to the very low levels of last summer. If the rate continues at the high rate, then it is clear that the models here do not work well, and an earlier eruption can be on the cards. Otherwise, I find that mid 2020 to late 2021 is the most likely window. One final point. In addition to the earthquakes, the local GOS (GFUM) showed sharp inflation over the past month. It looks convincing. But is it? The main problem here is that there the area has a lot of snow in autumn, and snow and ice on GPS systems introduces errors in the output. GPS system on the icecap often show large variations in their readings this time of the year. The plot below shows a multi-year GFUM curve. The jump seen in recent weeks is exceptionally large. But it happens at a time of the year when this GPS is normally out of action, so there is not a lot of comparison data. So again it is too early to tell. We will have to wait for spring to see whether the inflation is real, or is caused by the onset of winter. And that is where we are. We have a model, and we have a prediction. It suggests that we still have two to three years to wait. But somehow, I doubt that volcanoes feel any obligation to predictions. They do their own scheduling. They are complex systems. Perhaps what we need is not so much physics, but a study of volcano psychology. Grimsvötn still has ADHD. This post made heavy use of the book “The Glaciers of Iceland: A Historical, Cultural and Scientific Overview” by Helgi Björnsson, published by Atlantic Press in 2017 and translated into English by Julian Meldon D’Arcy. It has a wealth of information. I used it in particular for the historical background, and parts of the post follow the book very closely as I could not find a better way to phrase it. Fun activity: how many Icelandic volcanoes black dots can you see simultaneously? Had a busy day and just got a chance to check the news. I came here first to check to see if you were OK. I am glad you and your family is fine. Now the hard part…clean up and repairs. Keep us posted. Good to hear you and your family are ok motsfo. I don’t. The thermometer may say it’s warmer, but the rain and wind makes it really horrible, not to mention the mud… I’d prefer a crisp -10 and a snowy landscape over this gray misery. ‘Yall still had zones capable of liquifaction after 1964 cleared ’em out? Well, if it were a single volcanic blast, the plume could have exceeded 100,000 feet by a few orders of magnitude. Your looking at entire fleets of tri-axle dump trucks per second moving full loads en mass. Kelud 2014 worked out to around a Mag 6.0 equivalent when it went boom, and it could be heard 200 km away. The Mag 6.0 estimate was reached by a few of us using different methods and data. Mine was based off a (crude) interpretation of the milling formula taking a 300 x 300 meter rock down to the average size of the ash. I think Carl used the isopath method and derived the output based on distal ash-fall depths. Albert may have used the sound attenuation over distance method. What was amazing is we all came out reasonably close to each other. Yup, I used Isopaks to determine the volume. The amazing part with science is that if you enter the data through the theory it will end up as the same, and if it does not one has to correct the theory. In this case the theories held out and we got the same answer from (if I remember correctly) three different models. if you enter the data through the theory it will end up as the same, and if it does not one has to correct the theory. Or the data is wrong..
Can data actually be wrong in this case since it is nature giving the data? The data can obviously be corrupted by human interaction, erroneously collected, picked up in a distorted fashion by equipment, interpreted wrong, and so on and so forth. The data in situ will be correct, but on the path between in situ to entering the model it can obviously be corrupted. In my case some 30 people was involved in measuring ash depth, obviously quite a few could measure it wrong, or measuring it in contaminated places. The simple way is to remove fantastical outliers, let us say that 5 people measure 5cm of ash in an area, and someone all of a sudden reports 1 meter of ash, then you should probably remove it unless there is some very good reason not to. Data can be misinterpreted. Of course it can be plain wrong as well but that is unusual, at least among careful scientist. But instruments need calibration and this needs to be done carefully (less of an issue with ash depth, or course, where any ruler will do). And you need to know whether your measurement is representative. Ash can be carried by water, and you can get deep ash layers along rivers or in lakes, much deeper than the average would be over the area. Science is the art of care. Anyone have any info on Mayotte? The swarm continues. The last activity here was about 2050 years ago. Swarm centered to the east of the island. New seamount being born? Always interesting to see activity in a long dormant system. Came across this yesterday but doesn’t comment on what’s happening today. But still interesting. And Iceland is replaying Holuhraun. This morning’s earthquake maps raises nostalgia, with its depiction of the magma path. Completely incidental, of course. But nice. But it’s odd how data in 2 dimension can throw up a false lead if you don’t check out the full picture. To add my voice, Motsfo, I’m glad to hear you’re ok. I hope there’s no serious damage and that you stay safe. Coud also be the Holuhraun dyke thats still cooling down and contracting. Thats was one massive intrusion maybe as much as 1km3 remains inside that did not erupt. Bardarbunga then later sent a massive dyke towards the Holuhraun desert where it erupted. I miss it so much! Eldgosið í Holuhrauni is today just memories. The molten 1190 C rivers that once glowed so very brigthly have now turned into cold black rock. The lava field will stand in the landscape as a mineral monument for anyone to watch. It will become green of moss and in the future maybe a New Ice Age will scrape away and buldooze away Holuhraun one day. There are at least 3 things going on there. 1. The obvious one is as Jesper nots the continuing cooling of the magma in the old conduit shrinking causing earthquakes. 2. The continued formation of the crypto-dome out at Greip (near the turning point of the “knee” of the Holuhraun conduit. 3. Askja doing it’s thing. All of these 3 things create a slightly too long visual version of the Holuhraun seismicity track. Holuhraun was thought to be exactly that before 2014, a flank vent of askja, but I think now it is confirmed that even the older flow was from bardarbunga so it seems like the volcanoes largely overlap. Greip is definitely very interesting, maybe it hasn’t erupted because it connects to grimsvotn and relieves pressure, but one day that will not be enough, that might be when the ice melts over the next decades-centuries. The fact grimsvotn is going to be affected by all this the most is a scary thought, it could lead to quite a number of large lava flows erupting from the line between thordarhyna and greip, holuhraun sized and up, maybe forming a shield structure but made of flood lavas, something like the upgraded version of hekla. A slow (relatively speaking) effusive eruption from one of the vatnajokull volcanoes would also be very interesting, especially as a lot of grimsvotns eruptions have happened from the same place and could lead somewhere. Maybe bardarbunga and grimsvotn were both pretty tall and impressive volcanoes during the deep ice age, back when ice pressure supported the edifices and maybe restricted magma flow to the rifts somewhat, making large active shields that towered over the ice. Katla was probably like this too. However after the ice melted they collapsed in several ways and with not as frequent eruptions they instead became the source of their own glaciers rather than sticking out of one. Jesper, the name is far worse than Mount Viagra. That was a very kind rewrite for the American market. It would be more fun if Uptypingur erupted. Just from watching the news. If Upptyppingar erupted there would be an eruption of euphemisms from the media to gloss over the literal translation of the place. For those snickering about Mount Viagra, the actual name of Upptyppingar is far far worse. I will not translate it in here since there are children reading this. Translate it at the peril of your own sanity. It is after all the most perverse name of any volcano on Earth. And I mean perverse in a sexual way. Holuhraun was 1188 C to almost 1200 C about same temperature as Fissure 8 at later phases. Greip may become a future highly productive volcano. More supply from the mantle is needed to charge Greip up. Carl , Albert why is Grimsvötn negative annomaly on these gravity maps? Grimsvötn haves maybe the worlds largest magma supply ( I say Hawaii winns ) but you guys knows more. Why is Grimsvotn negative on the gravity maps? And Bardarbunga is totaly strange on these maps with all the magmas in the caldera ring faults ( yellow ring and blue cold caldera floor ) Grimsvötn is almost completely blue thats pretty strange. It is not that simple. The whole volcano has a positive anomaly, related to the magma chamber. The caldera has a negative anomaly with respect to the rest of the volcano, but is still positive net. It is a local depression. The two explanations in the literature are caldera infill with low density material (pyroclastics or such), or a recent collapse of the caldera. Ohh there is then the anser to Carls mystery question then? There is more mystery. The heat flux through Grimsvotn is much larger than would be expected from the plume. That must be temporary, but it is not known why. It is why the possible cooling of the deeper reservoir is of interest. As if there was a heat pulse some time ago from which it is still recovering. A possible answer might be that Iceland had a larger than usual plume pulse in the decades prior to Laki, and that it has more or less been recouperating and cooling since then until new magma from depth started to enter en mass during this plume pulse. Obviously that requires that the previous pulse was either weak, or skipped largely Grimsvötns deeper reservoir. Carl how hot was Krafla 1984? I would be willing to bet that skaftar fires would have been hotter still though, at those sorts of eruption rates and with so much new magma, the lava might have been the hottest basalt erupted in recent time, probably well over 1200 C and maybe even 1300 C, although the fountain height would negate a lot of that by the time it landed so the lava might have otherwise been fairly normal. Still, the eruption would have been like opening the gates of hell, 2 km high lava fountains towering far above anything else on the island, and above the fountains would have been 10-20 km tall plumes of tephra. The glow might have been so bright that it could be seen far beyond Iceland, maybe even as far as parts of the UK or Europe. Allegedly it is possible to see vatnajokull from the Faroe islands (from wikipedia though so maybe debatable), so a massive effusion of lava (the amount of glowing incandescent lava in 1783 would have probably been over 100 km2) could create a glow that would go very far indeed. In a way the dead zone erupts like hekla, a plinian first stage followed by massive lava effusion, although that is where the similarity ends really. What might be the worst outcome of them all would be a true rifting fissure, one as big as 1783, but which happens under vatnajokull while the ice is still there, that would be either the biggest ash cloud over Europe in (a long time) or the biggest jokulhlaup in recent history of iceland (and likely the death blow for vatnajokull). This would be like 2011 but imagine 10 of that all in a line followed by massive flooding and then lava fountains jetting out of the glacier, this is about at the pinnacle of basaltic volcanism, only a flood basalt in all its glory will top that, and one of those isn’t happening in our lifetime. But Holuhraun was very hot too. Holuhraun was 1185 c to 1198 C thats very hot almost as hot as halemaumau lava lake and hotter than Puu Oo magmas. That makes the Iceland hotspot.. almost as hot.. as hot as Hawaiian one. Icelands hotspot is hotter than I first belived years ago. The largest rifting dead zone eruptions, ( thin litosphere and tapped from mantle ) should be able to reach very high temperatures as you says above. Mineralogical data from Icelands interior and kistufell suggest the plume is getting stronger over time, and as Hawaii Icelands plume is undergoing a boost maybe. When Icelands plume peaks in a few million of years it may take the title as most powerful oceanic plume in the world. I had made this mistake at one time due to the fluidity of the magma, but according to more reliable sources, (Carl) the magma was in the 1100°C range. But really? can Vatnajökull be seen from highest point in Faroe islands? Is Earth large enough that horizon is that distant up there? Vatnajökull would have to be around 12000m high to be visible in direct line of sight from Slættaratindur(880m) (if my math is correct, working with a distance of 500km). It should however be more than possible to see a huge volcanic eruption under great conditions, if the ash is thrown up high enough. Nope, weather has a tendency to mess with things here. Having a day with no clouds all the way to Iceland, is something which happens perhaps once a year, if even that often. Not sure of the topic here, but at that range, I would imagine that anything “glowing” would be a reflection off of the lower level of any clouds in the area. Sort of what you see over shopping center parking lots from a distance at night. The kilometer high lava fountains and 20 km high tephra collums and huge pyrocumulus and ashclouds. All the clouds and pyrocumulus woud be lit by the mammoth lava fountains casting a intense fiery glow for 100 s of kilometers. #Mordor awakes. Öræfajökull getting pounded by small eqs now. Something like 18 in the last 3 hours, with depths between 0.1 km and 7.7 km. Likley many 100 s km2 of glowing surface. The huge fountains woud be the most powerful light source. Then you haves the huge fast moving open lava channels and fast moving Aa flows that woud give of huge ammounts of Light too. Skaftareldahraun is almost completely Aa lava and thats pretty much proof of its very very fast eruptive rates. Lakis glow woud be seen far and wide and specialy during a high overcast night as the light bounch on the high clouds above like a mirror.